For many PEG channels it can often be confusing to understand what their closed captioning obligations are. The FCC and the ADA have regulations for closed captioning, each with their own set of standards. 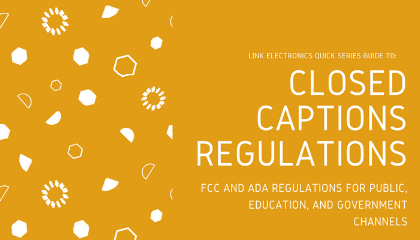 This is the first of a three part series focusing on what the regulations for closed captioning are for PEG channels and the steps taken to avoid fines and provide accessible content for all viewers. With more than 200 products to service the broadcast industry, Link Electronics is able to tailor a solution to fit your needs.